The world went paperless years ago. But there are a couple of holdouts, a few things which everybody still does with paper. Perhaps most notably, business cards. They remain the most common way to quickly exchange contact information, and like any form of paper-based media, they can end up creating clutter. If you’re only managing two or three business cards, then it’s no big deal to write them into your address book, or into a spreadsheet. But when you’re dealing with more significant quantities, and you don’t want to your time to be horribly wasted, you really need a machine that can do the job for you. Digitizing documents is a technology that’s essentially been mastered. When the right scanner, it’s possible to take paper documents and turn them into accessible databases in only a couple of seconds. Which can be terribly useful because networking is just as important as it ever was, but the rolodex has fallen out of style. Basically, you want a scanner that’s capable of handling the throughout you intend to put it through. Someone who’s only scanning the occasional business card that across their desk needs a different machine than someone who’s scanning dozens or hundreds of cards on a regular basis. Scanners use artificial intelligence to read documents. That means they need to be programmed for specific languages. Unless otherwise specified, you should assume the scanner was only programmed to read English. Many of the better business card scanners on the market can actually read a couple dozen languages, and these kinds of features generally add little to the cost of the product. But they’re not essential unless you really expect to come across cards in other languages. You might want a document scanner that can handle more than business cards. Though getting rid of business cards is a great first step, being able to get rid of other types of paper documents can help reduce clutter as well. Here’s an area where details count. Some scanners are capable of accommodating larger documents or varied density, glossiness, and thickness. Some aren’t. 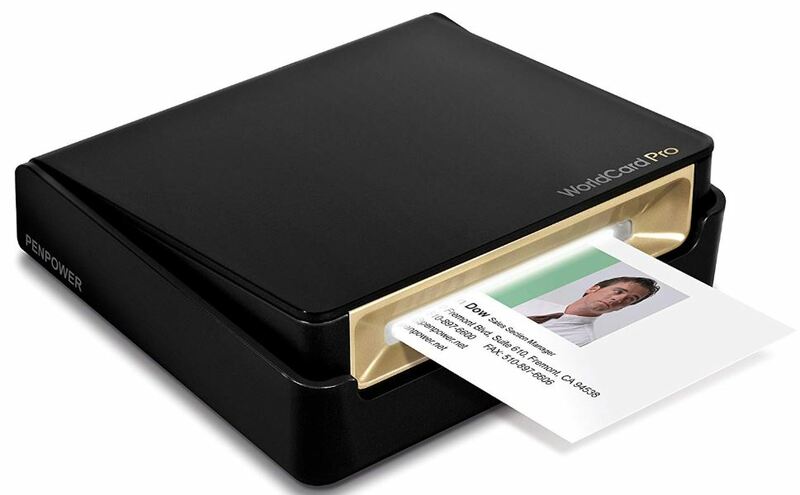 If the scanner was made specifically for business cards, then you’ll probably have no trouble fitting cards inside. But when you’re looking to scan more than cards, you’ve got to pay closer attention to the kind of supported media. Document scanners are supposed to make your life easier, so it makes sense to ask: how easy is using the scanner? How many ways can you access or share your data? Are there different formats available? Can you get your data through a mobile app? Is your data capable of being exported into different formats? There’s a big difference between having digitized business cards, and having them in a neatly accessible format. 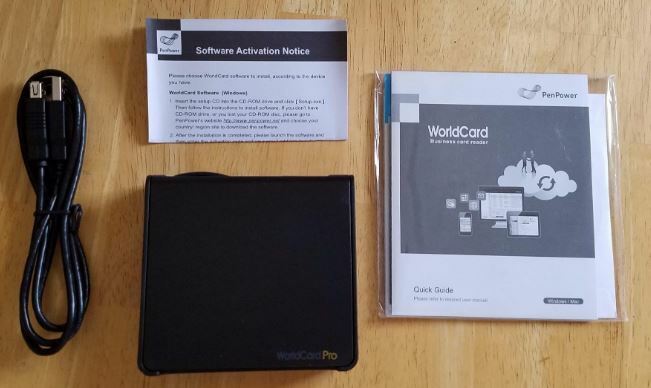 The PenPower WorldCard Pro is an excellent place to start because it’s a fairly impressive little machine. Like you’d expect, this scanner is capable of recognizing business cards and then digitizing them for management and storage. But unlike many card scanners, this one actually uses a tilting mailbox-style entrance. It’s pretty fantastic for letting you place business cards into the machine quickly, while also protecting the device from debris and dirty cards. The WorldCard Pro measures about 6 x 6 x 2.5-inches, which makes it similar to using a fairly handheld flatbed scanner. It weighs about two pounds, so neither size nor weight really gets in the way of portability. You slide in business cards from the front, and the scanner shoots it back at you once it has been digitized. Consequently, the process of using this scanner is basically foolproof, and it doesn’t get more complicated when you look at using the data. Once the cards are in your system, you’re able to efficiently and quickly manage them, assigning categories to various cards, or even adding photos to various individuals. Having established your database, you’re then able to search by keyword to discover specific individuals or categories. Clicking the address portion of the website text will even link to the contact’s website, and a map of their location. The PenPower WorldCard Pro supports several languages. It’s actually capable of recognizing cards in 24 different languages. Once you’ve got your cards digitized and you want to use the data, you’ll be able to export or import it pretty easily. You can move it into your address book in various mobile devices, or even load it as CSV, JPG, HTML, or their own WorldCard file format. As a result, you’ve got endless options for platform support. The Fujitsu ScanSnap iX500 is more than a business card scanner. 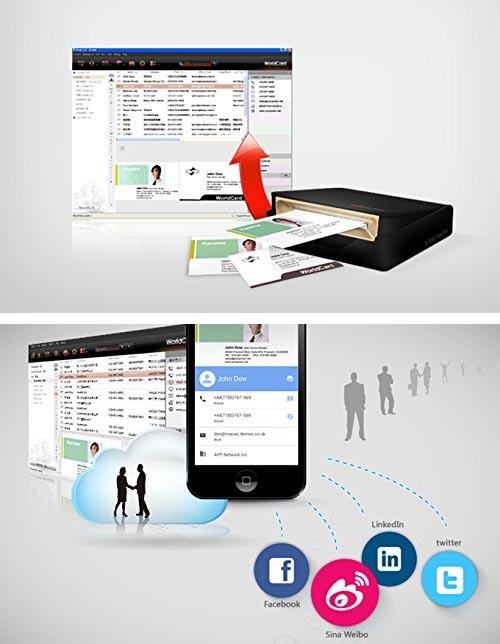 Yes, it lets you streamline the management and workflow of business card digitalization. But it also helps digitize other types of documents, from expense reports to receipts. Similar to a modern scanner/printer, you can operate the iX500 wirelessly. But the USB 3.0 connections leave little room for complaint. Again similar to any of the best scanners on the market, the iX500 allows you to scan, consolidate, and organize all your documents into searchable folders. Fujitsu’s management software will even read and parse your data with minimal involvement or micromanagement. Consequently, you can retrieve your digital content while using basically any device. The iX500 measures 6.1 x 11.4 x 6.6-inches, and weighs about seven pounds. Similar to a full-sized printer, this scanner’s paper slot allows you to feed through documents with a maximum size of A3. It’ll easily take in full sized legal paper, business cards, receipts, and so forth. It even handles thicker media pretty well, too. For example, you don’t have to worry about folded paper getting caught in the machine. But you don’t want to run through anything thicker than card stock without being careful. Unlike the previous business card scanner on this list, the iX500 makes use of an onramp design to offload content which has been scanned. This design is again, very similar to a printer. And like a printer, it’s great for making the scanning process automated and hands-off. It even lets you move your data into the cloud with one press. The design of the ScanSnap iX500 could really use a flip-up trap. Something to prevent documents from being ejected after they come through the machine. If you feed them through without a trap, they can get ejected into the floor pretty easily. Depending on how you’ve setup the device, that doesn’t have to become an issue. But it’s something to keep in mind during placement. 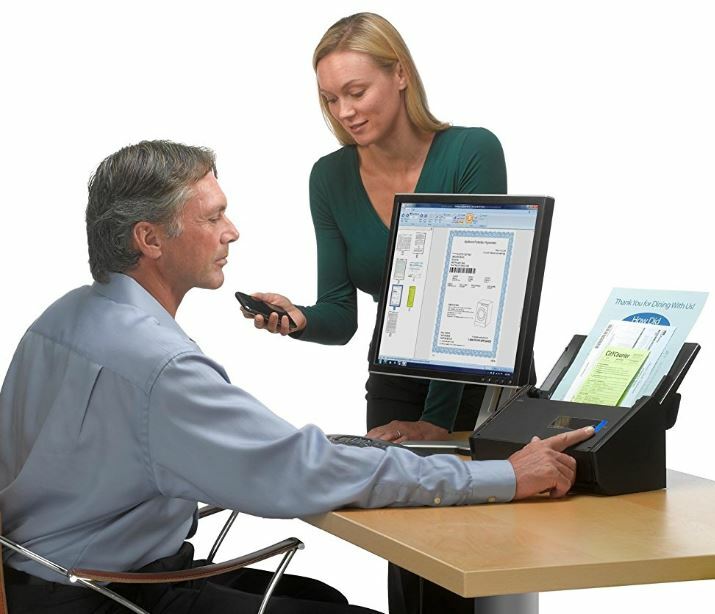 The ScanSnap iX500 supports both Windows and Mac platforms. It also has support for Android and iOS mobile devices. Whether you’re controlling through desktop PC or mobile, you have endless options. Moreover, you can export data for tax preparation, or export accounting data. The iX500 supports formats which are compatible with Turbo Tax, QuickBooks, Excel, and so forth. You don’t generally encounter compatibility issues because it supports exporting in CSV, IIF, PDF, TXF, and XLS. That makes it widely possible to share and collaborate your folder of documents, and without getting a bunch of third party services involved. Unfortunately, there is a drawback. While the Fujitsu control software for archiving data is truly incredible stuff, the iX500 only includes as one-year premium license. If you want to keep using every feature it has to offer, especially the sharing features, you’ll need to pay for their software service after your first year of use. The Ambir DP667 is pretty close to being an ordinary business card scanner, but it does slightly more than that. It’s actually quite capable of scanning ID cards, licenses, and even insurance cards. It can tackle cards that have been embossed, and it can handle color photos. And the DP667 is entirely powered through USB, you don’t need AC power adapters. In short, the Ambir DP667 was made to fit essentially anywhere. Both physically and with respect to its functionality, it was intended to be widely adaptable to a huge variety of professional needs. That’s largely possible because of the professional grade design, which ensures you don’t encounter the kind of issues associated with cutting corners on a card scanner. The first time you’ve got the DP667 in your hands, it’s a little underwhelming. 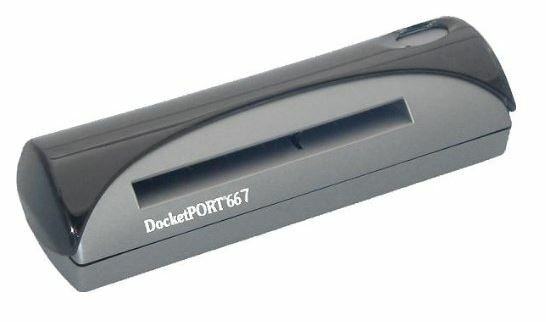 Admittedly, the simple gray chassis really isn’t going to turn any heads, and the fact they’ve written “DocketPort 667” across the face of the device only adds to its generic appearance. But there’s more to the 667 than initially meets the eye. The DP667 measures 9.3 x 2.9 x 5.7-inches, and weighs just short of half a pound. It’s roughly about the size and weight of an unloaded stapler. The generally small size and lightweight design of the DP667 means it is exceptionally popular for security agencies, IT installations, and so forth. Because you can very easily shove it in your pocket, stick it in a drawer, or otherwise keep it out of your way. One thing to keep in mind. The input field can support business cards in 4” in height, and about 10” in length. That’s capable of capturing unusual business cards, as well as a variety of slightly lengthier documents. Once scanned, your content defaults to PDF format. You can also save as JPEG or TIFF, but it takes an extra click to do so. Once passed through, the scanner is capable of supporting a 600dpi resolution for your digitized documents. That’s pretty close to the kind of accuracy you’d get from using a full sized PC printer, certainly nothing to complain about. And that resolution is important given the fact you’re trying to scan smaller text, which can be inherently difficult to read. The DP667 can support Windows. But it can’t support other operating systems. While you could view your data on a Mac after transferring it from a Windows PC, you would need Ambir’s Mac compatible scanner to skip that extra step. The only significant downside to this card scanner is the Ambir DP667 does not include any calibration sheets. But reproductions at 600dpi could be called near-perfect, and suitable for most types of professional application. The Fujitsu ScanSnap iX500 is a full-fledged document scanner. From the hardware to the software it’s based upon, this equipment provides an extensive array of options for professional document digitization. The process of organizing your digital documents is practically completed for you, which makes the iX500 a great choice for someone who intends to scan more than business cards. The PenPower WorldCard Pro is a simpler option, but not so simple that you sacrifice quality. 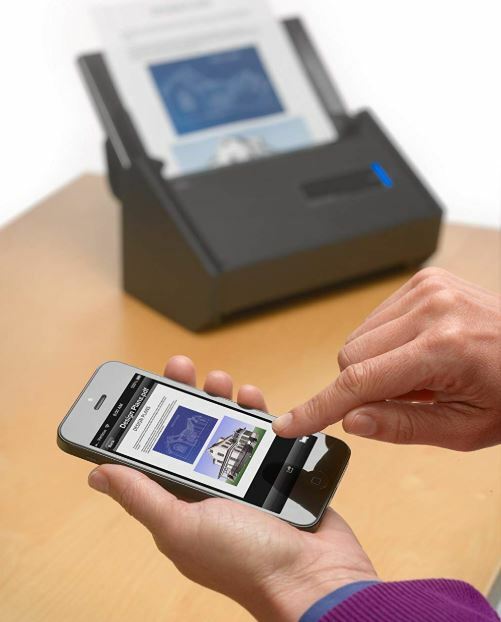 It can digitize and scan business cards in only a couple of seconds. It can recognize two dozen languages, and it has some of the most robust data exchange options of any scanner on the market. Though you’re limited to scanning business cards, the PenPower WorldCard Pro can do that job with excellence. For anyone dealing with high quantities of throughput, or scanning several languages, this might be a great choice. 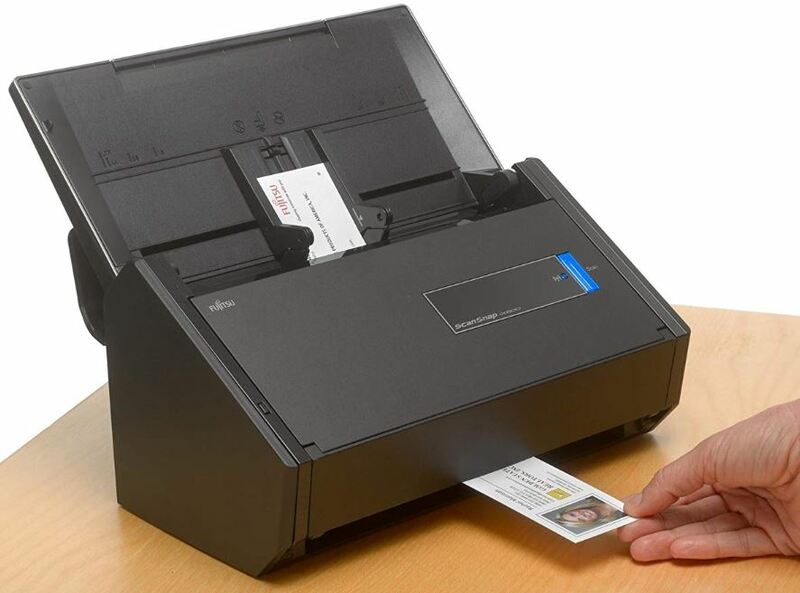 The Ambir DP667 Card Scanner can do a bit more than business cards. But the scanner is limited by its smallest dimension: its 4” height capacity. If you don’t stray too far from business cards, you’ll find this scanner is highly effective and highly portable. Which makes it a great choice for someone interested in a compromise between the WorldCard Pro and the iX500.